1. I’m strangely attracted to zebra and leopard prints. Whereas, I used to call my mom’s leopard print travel-bag “a wounded animal,” now my only wish is that it came with a matching dopp kit so that I could inherit the whole shebang. 2. I love arts and crafts and DIY projects. 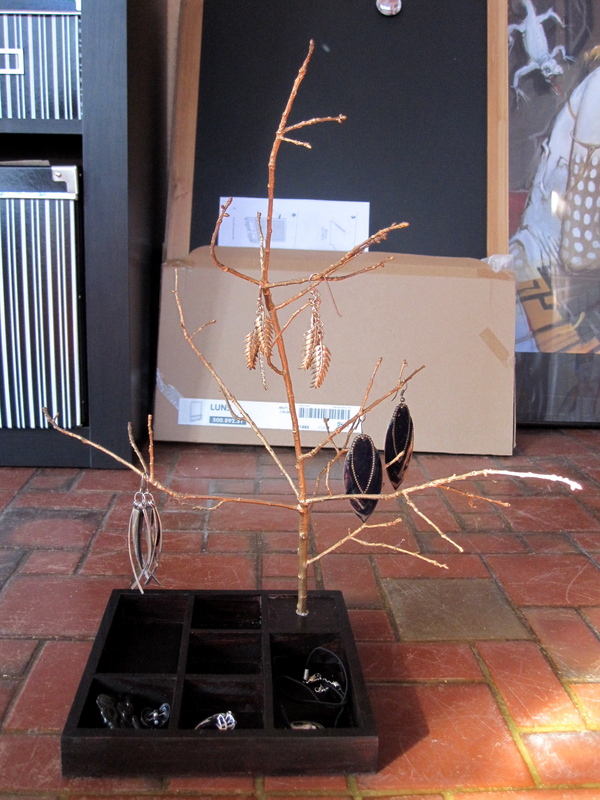 For Christmas, the Southerner and I made 18 jewelry trees, one for each woman in our family. This project was so much fun to do together and I love that the branches on the trees are from our backyard. 3. I want to make out with Miranda July. This isn’t a new thing. I’ve wanted to make out with her since my mid to late twenties, but Cracker Jack gave me her new book for Christmas and now I REALLY want to make out with her (Miranda, not Cracker Jack). 4. I’ve finally figured out why I love reading personal blogs and writing my own. I have always wanted it to be ok to obsessively stalk people I was interested in. Blogs allow me to do that without feeling creepy, and writing my own allows me to give that opportunity to someone else. Merry Christmas and Happy New Year’s everyone! The Southerner and I will be snuggled up together in a hotel room in Sarasota to bring in 2012. May your evening be filled with fancy champagne and Belgian chocolate-dipped oreo cookies.